Home Uncategorized The Institute of Home Economics organised its annual academic fest, Comscape 2019! 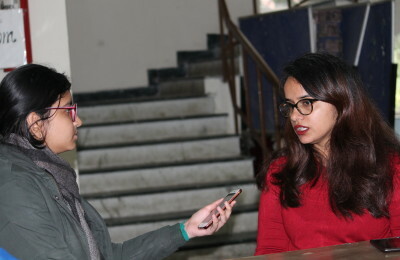 Department of Development Communication, Extension and Journalism along with #NoFilter, the media club of Institute of Home Economics organised its annual academic fest, Comscape 2019 on February 01, 2019. The Day witnessed a series of events with the first one being Guftagoo, a speaker discussion. The guest of honour and keynote speaker for the event was Dr. Lakshmi Shankar Bajpai, retired deputy director general of All India Radio. The panelists encouraged the students to follow their dreams and pursue their passion. RJ hunt witnessed the aura of RJ Rahul Makin and the event had talented participants from various colleges of Delhi NCR. Goonj, the street play event had top dramatics societies of the drama circuit participating for attractive prizes and their energy levels left the audience spellbound. The event on a whole was a success and a day full of learning, experiences and memories.